Here we go again. Confusion reigns supreme about Italy's so called "derivatives bets" on which Morgan Stanley collected some 2.6 billion euros. Lets look at some media quotes. Reuters: Education Undersecretary Marco Rossi Doria made the announcement in answer to a parliamentary question after U.S. investment bank Morgan Stanley said it had received 3.4 billion euros to close derivatives contracts with Italy's Treasury. The Italian government has made the same error that Harvard University made some years back. See the post called Harvard's big swap unwind from 2009. Italy, with its numerous municipal capital projects had always been concerned about rising interest rates. If rates were to go up they reasoned, their financing costs will go up as well. So as the Euribor rates came down some time ago, they figured they would lock in what they thought at the time were attractive financing rates. The government put on swaps and some swaptions that would rise in value if the long term swap rates were to rise (to compensate them for rising funding costs). 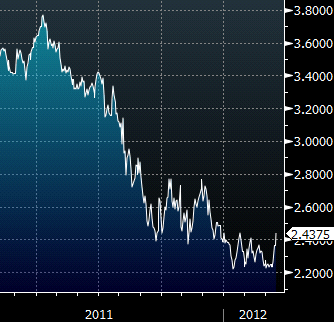 But swap rates kept falling in 2011 as the Eurozone was looking into the abyss. Unfortunately for Italy, their funding rates completely decoupled from swap rates. Swap rates represent the forward expectation of Euribor (for the next say 10 years). These rates were elevated relative to German bunds, but were still declining as German rates kept falling. So not only was Italy losing money on the swaps because of lower swap rates, but the nation was also having to pay much more for funding because its sovereign credit risk increased. This is an example of "basis risk", when your hedge decouples from what you are hedging and both end up going against you. To add insult to injury, Italy also got downgraded to a level that triggered the swap/swaption unwind. Reuters: He said the contracts with Morgan Stanley, made up of two interest rate swaps and two swap options, were closed under an "Additional Termination Event" clause. These co-called break clauses are rare in contracts involving sovereigns, and the clause was only present in the Treasury's contracts with Morgan Stanley, Rossi Doria said. "Additional Termination Event" clauses are common under ISDA agreements. Some of these clauses basically state that if one counterparty's credit deteriorates, the derivatives contracts in place between the two counterparties terminate. So Morgan Stanley terminated the contracts with Italy based on the downgrades and received the unwind value. Of course the media hype out there makes it sound as though Morgan Stanley suddenly made 2.6 billion euros. It didn't. Its swaps were hedged - so whatever it made on Italy, it lost on the hedge and other offsetting trades (except for the initial spread). The media confusion gets even more strange when they try to reconcile the numbers between what Morgan Stanley reported on its books and what Italy actually paid them. Reuters: He did not account for the discrepancy between the 2.567 billion euros he said the Treasury had paid to Morgan Stanley and the 3.4 billion euros referred to by the bank in its report to the U.S. Securities and Exchange Commission. There is nothing to "account for". Not all the contracts with Italy have been unwound and Morgan Stanley was showing its mark to market (unrealized) gains. So Italy is taking more pain than the 2.567 billion euros they paid out - the remaining losses just haven't been realized. It's unclear if Morgan Stanley has or can call for margin as was the case with Harvard. The more troubling point is the size of Italy's swaps still outstanding. Reuters: He added that the state still has derivatives contracts worth some 160 billion euros, or nearly 10 percent of the 1.624 trillion euros of Italian bonds in circulation. Because these are off balance sheet, it is unlikely that they are reflected in Italian government's overall liability measure. But even if these swaps are under water by say 10% (very roughly, 100bp move in swap rates times duration of 10), it will add another 1% to Italy's outstanding debt. 16 billion - extremely painful, but not the end of the world for Italy. Reuters: Italy's use of derivatives to guarantee its public debt yielded a loss of 2 billion euros in 2011 in the form of higher interest payments and 4 billion euros in 2007-2010, official figures show. Guarantee? There is no guarantee here. The reporter here must be confusing rate swaps with CDS - two slightly different contracts. These are just interest rate hedges gone terribly wrong. Apparently the Italian bureaucrats responsible for these hedging programs went to Harvard to learn how it's done.